The "gig" economy has fuelled the growth of convenient and cheap delivery; increasingly this looks threatened as the rules on labour tighten. The next wave of innovation is needed to drive success. Delivery has got significantly better and cheaper in the last decade, driven by the boom in e-commerce underpinning growing density, combined with better platform technology, hyper-flexible zero-hours and piece-rate self-employment. Even before new regulations, those effects will be approaching diminishing returns. In these markets, operations is strategy and those with advantaged models on price or service level will usually win. With the increase in costs and the tightening labour environment, it is definitely time to find the next wave of innovation. Unless companies are going to pin their hopes on driver-less vehicles and drones (which remain on a distant horizon) the solution will be in trying to move towards aggregation of demand and volumes. Smart logistics businesses will be looking to expand their footprint of drop-and-collect locations (as Hermes has done with 4,000 parcel shops) and exploring partnerships with businesses that can aggregate volumes, and then pricing to drive volume through them. This leaves the way open for innovative solutions to aggregate demand across networks, whether that be Pick Up Drop Off Networks (PUDO) like Collect+, first mile aggregators like GFS and Whistl, or even wholesale logistics platforms like Palletways. Perhaps even the Post Office is due a renaissance if they broke with centuries (literally) of tradition and worked with a wider range of delivery businesses outside Royal Mail? The winners will likely be ones who bring advantaged economics, by piggybacking off other activities. As such, the left-field entrants will be retailer networks who can subsidise activities with healthy cross-shop economics. We already see retail stores branching out e.g. Next handling Amazon collect and returns, Argos handling eBay volumes. It will take time, but the delivery landscape of the future is going to look very different for retailers, businesses, providers and consumers. 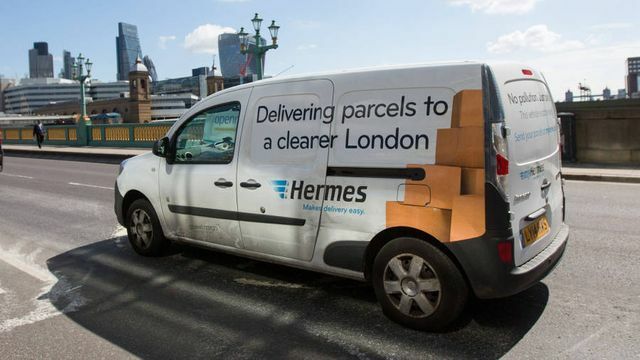 Couriers working for Hermes, one of the UK’s biggest delivery companies, will have the right to guaranteed minimum hourly rates and paid holiday under a trade union deal described as the first of its kind in the gig economy.